Today is my last day as Executive Director of Girl Develop It. After nearly five years leading the organization, I am leaving GDI the same way I started: filled with gratitude. I’m grateful that my own involvement as a Girl Develop It student, and later local chapter leader in Philadelphia, set me on a path to becoming the organization’s first full-time employee and first Executive Director in 2014. My passion for this community has grown over the years just as exponentially as the community membership itself has grown. But it was first cemented in that very first class where I sat in the summer of 2011 surrounded and inspired by diverse women from all backgrounds, eager to learn to code. I’m also grateful that I’ve had the opportunity to come in at the ground floor and build an organization alongside so many passionate and incredible people. What started as a truly grassroots effort became a nationwide movement because of the drive and dedication of women across the country banding together to create communities of support and empowerment. I’m especially proud to have grown the organization’s budget 93%, enabling the hiring of a talented and diverse full-time staff, who together with a robust chapter leadership network, launched 33 new chapters between 2014 and 2018 – totaling an astounding 63 US cities with GDI chapters bringing people together to learn. Today, GDI has a membership of 110,000+, a 633% increase from 2014. With a well-loved brand and positive impact to show, we forged innovative and sustainable partnerships with corporate sponsors like Salesforce, Google, Benefit Cosmetics, Cars.com, and more. In 2017, with the support of Capital One and Barclaycard, I was grateful for the opportunity to launch the prison program in partnership with Baylor Women’s Correctional Institution, the first of its kind in the country teaching incarcerated women, one of the nation’s most underserved populations, coding skills . From the beginning, GDI set out to fight for inclusion, equity, and diversity for women and underrepresented groups who were left out of technology education. The stories of students who completely transformed not only their careers, but their lives will continue to inspire and propel me forward — stories like the grandma from Atlanta who built an app to support domestic violence victims; the stay-at-home mom from Fargo who grew her coding skills and found the confidence to apply for (and get) her first development job; and the entrepreneur whose idea to build an online marketplace that helps campers book unique experiences turned into a company that now employs more than two dozen people and was featured in Fast Company. While growing the organization into what it is today certainly had its challenges, I wholeheartedly believe in this mission and GDI’s ability to deliver on it. Finally, I’d like to share my immense gratitude for my leadership team and everyone who I’ve worked with who helped to build GDI over the years. Thank you for letting me be a small part of leading it. I look forward to seeing where this movement goes next. 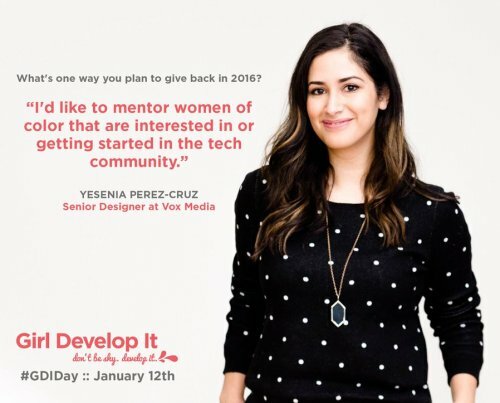 #GDIday is coming January 12th! Cross-posting content here from Girl Develop It’s blog. Did you know that Girl Develop It is celebrating a huge milestone this month? Over the past five years, we have taught 60,000 students to code across our 50+ chapters. That’s huge! 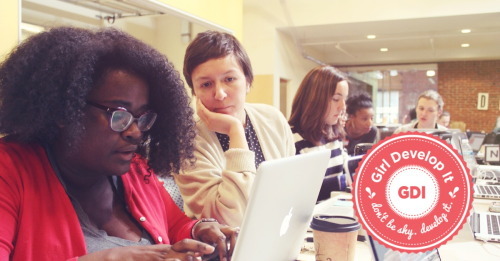 #GDIday: Tuesday, January 12th will be the big, fun start to our month-long celebration. Follow along on Twitter, Facebook, and Instagram as we share inspiring messages from thought leaders and heroes in the community. Please RT and spread the word! Reddit #AskMeAnything (AMA): On GDI Day 1/12 at 12pm EST, Girl Develop It Executive Director, Corinne Warnshuis and Co-founder/Advisor Vanessa Hurst will be on Reddit answering questions about learning to code, our 50+ chapters around the US, and more. We’d love for you to join the conversation. Follow along and join in! Tell us: What’s something you’ve built lately? How Girl Develop It has made an impact on your life?